Have you ever dreamed of something a bit more scary than the dusty skeleton of a Prehistoric dinosaur when visiting your nearest Natural History Museum? You see, through your 3D glasses, how the dinosaur walks around and moves towards you with its tail waging. You get a whole new perspective on how it looked when it was alive. What if it came to life right before your eyes? That’s the experience Berlin’s Museum für Naturkunde is proposing in connection with Google thanks to a Virtual Reality headset connected to your smartphone. “The Giraffatitan that we have here in Berlin stands as a skeleton. What happens in this animation is that the skeleton all of a sudden morphs into a living, three-dimensional animal. And you see, through your 3D glasses, how the dinosaur walks around and moves towards you with its tail waging. You get a whole new perspective on how it looked when it was alive,” explains Wieland Holfelder from the Google Engineering Centre in Munich. The exhibition and virtual reality video can be accessed on the Google Arts and Culture website. 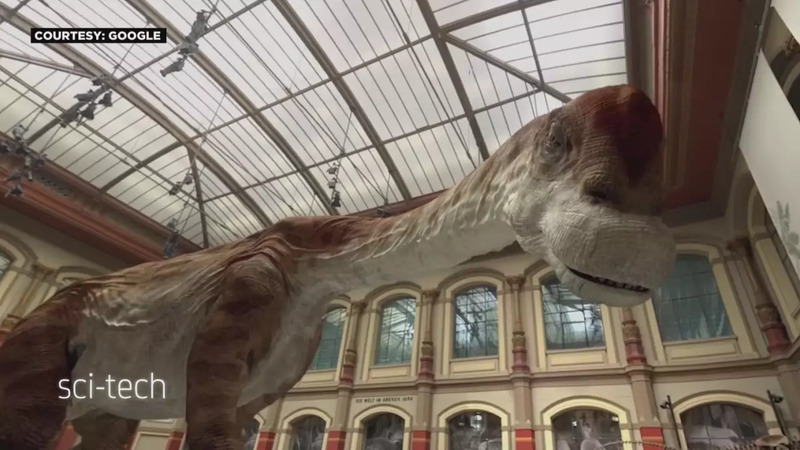 Fifty museums from London to New York are taking part in the project offering online visitors an immersive 360-degree experience in which the exhibits come to life. For an up-and-close experience at Berlin’s museum, don’t forget your Google viewing glasses.